iCal Converter - export Outlook Calendar and import iCal to Outlook. An easy-to-use iCal Calendar converter. Import and Export Calendar folders or single events to or from Outlook using iCal Converter add-in for Microsoft Outlook. 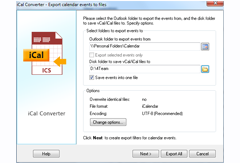 Convert Calendar from Outlook to iCalendar (ics file) or vCalendar (vcs file) format. Export Microsoft Outlook Calendar to iCal or vCal. Import iCalendar or vCalendar files to Outlook. iCal Converter allows you to import iCal to Outlook Calendar, as well as to export to one or multiple iCal (.ics) or vCalendar (.vcs) files the whole Calendar folder containing unlimited number of events. If you need to sync, export or move your Calendar from Microsoft Outlook and share it with others, the easiest way is to use the iCalendar Converter software. Export Outlook Calendar and convert Calendar from Outlook to iCal format. iCalendar (.ics) and vCalendar (.vcs) are file formats for Calendar. iCal is compatible with Google Calendar, iPhone, iPod and Mac, Android, Blackberry, Entourage and most of cell phones. If you're an Apple user and need iCalendar for Windows, this software is your best bet. To back up, share or exchange your Outlook calendar, you can export it as a calendar vcs or ics file and send it as an attachment to email, instant messenger or any other way. You can select any Calendar folder, including Microsoft Exchange or Public folders or choose only selected Outlook Calendar events to convert them to the iCal format. iCal Converter for Microsoft Outlook is a user-friendly .ics converter integrated into Outlook file menu and toolbar for easy access. During the 14-day free trial period iCalendar/vCalendar import and export operations are limited to 5 calendar events only. To convert unlimited number of events to the iCal/vCalendar format, please purchase the full version. Microsoft Outlook iCal, vCalendar Converter. Convert Calendar from Outlook to iCalendar file format. With iCal Converter you can easily convert the whole Calendar folder to one or multiple iCal ics and vCalendar vcs files or export only selected Outlook Calendar events with just one click. Import ics files to a selected Outlook folder. Export iCal ics. Export Outlook Calendar to iCalendar. iCal Converter will allow you to export to iCalendar (ics file) or vCalendar (vcs file) the whole Calendar folder containing unlimited number of events. Export any Calendar folder, including Microsoft Exchange and Public folders. Back up, share or exchange your Calendar easily. Import vCalendar or iCal to Outlook Calendar folders. iCal Converter will import iCal to Outlook and convert it to Outlook Calendar folders. Import the iCal file format from several applications and devices. Save all selected Calendar events in one vcs / ics file (vCal and iCal). Select to export several events and select the option “Save events into one file”. All selected items will be saved in one .ics / .vcs file. Basic duplicate management solution is provided. Select to import iCalendar or vCalendar and keep duplicate items, replace duplicates by those imported from iCal files or keep your old events. Keep your Calendar free of duplicates automatically. Synchronize or move Outlook Calendar to your mobile devices. iCal is compatible with Google Calendar, iPhone, iPod and Mac, Android, Blackberry, Entourage and most of cellphones. Just attach the ics file to an email message or send a file via bluetooth or cable. Filter the Calendar events that you import or export. Create Calendar events export and import filters by all day events, private events. Exclude or include certain categories and labels. Select a time interval of events you want to export or import. Supports most iCal and vCalendar encodings of Microsoft Outlook Calendar. iCal Converter for Outlook supports ics and vcs files in different encodings, including Chinese and Japanese, that are not supported by Microsoft Outlook. Easy-to-use add-in for Microsoft Outlook. iCal Converter is integrated into Outlook file menu and toolbar for easy access. Select a Calendar folder or a single event and click the “Export events” or “Import events” button on the toolbar. You can also run the program first and then select a Calendar folder from the list. Works with Microsoft Outlook 2010, 2007, 2003, 2002. Compatible with Microsoft Exchange and public folders. Export Calendar from one Outlook version and import vCalendar or iCalendar file to another version without worries. Duplicate Remover for Microsoft Outlook Find and remove Outlook duplicate items in just one click. Merge duplicates automatically. Free duplicates finder.